We were halfway through an eight-hour car ride when I decided tonight was the night I would propose. Aimee had fallen asleep in the passenger seat, and as the highway zipped by, I prayed silently and solidified my decision. Since early college, St. Thérèse of Lisieux had been my go-to intercessor and spiritual role model; that night, I consulted her yet again. You’re my wing-nun, help me out, I asked this 19th-century French Carmelite. Help me be confident, smooth, and … well … successful! The engagement ring, as it had been for weeks, was with me. I had made no elaborate plan with sky writing or violins or a hot air balloon ride; I had simply been waiting for the right moment and carrying the ring close so I’d be prepared whenever that moment arose. I knew only that I wanted to propose in an adoration chapel where Jesus would be present with us–a sacramental instinct. Perpetual adoration chapels, often located on the property of a Catholic parish, are open twenty-four hours every day. Inside, the consecrated host—the Real Presence of Jesus—is displayed in a gold vessel (called a monstrance) set upon a small altar. Adoration chapels are quiet, still, and usually quite small, all characteristics that build a sense of intimacy and enclosure from the outside world. Of all the demonstrations of love I could plan, of all the beautiful places I could imagine to propose, a chapel where Jesus was present and enthroned seemed supreme. Of course, the long interstate between Dallas and New Orleans doesn’t have chapels just tucked into truck stops, so I began plotting how to make a long, late drive end at a Catholic church. As we got closer and closer to our destination, I finally turned toward a parish that I knew had an adoration chapel, woke Aimee, and tried to ask casually if she wanted to stop in. That wouldn’t have been so unusual, except that it was now almost midnight, and we had been driving for eight hours. “Now?” she asked, but then she saw my sweaty and shaky hands on the steering wheel. Knowing something was up, she agreed. “Yes. Go ahead! Go on!” I chattered. Come on, St. Thérèse. Help me out! Amused, Aimee headed into the chapel. When I joined her with the ring now concealed in my palm, I immediately noticed two things: first, I saw a red rose laid out beneath the monstrance where Jesus was exposed in the Eucharist. St. Thérèse! Nice! The sight of the Little Flower’s trademark symbol immediately gave me the sense that she was with us. Second, I saw a man praying in the corner; I had forgotten there must always be someone in Adoration to pray and watch with Jesus. Not wanting an audience, I approached him and quietly asked if he would step out so I could propose. He didn’t fully hear my whispered plea and demanded loudly, “What? Leave? Why?” I tried to silently gesture again and keep him from blowing the surprise. He finally grasped my intent, shot me a broad smile, and ducked out. This is where we begin and end, in Christ. I have often come back to that truth—on the day Aimee and I stood at the altar; on the days we adopted our children; and most profoundly on the days when I have felt lost as a husband or father, when I have failed, when I struggle to recall the affirmation I found in that red rose. Coming back to the heart is coming back to the reality that, as St. Thérèse declared, “All is grace.” We depend upon grace for the life of our souls and the flourishing of our personhood. All seven sacraments—Baptism, the Eucharist, confession, confirmation, marriage, Holy Orders, and Anointing of the Sick—exist for this purpose, to give us a point of tangible contact with that grace, so that we may become more and more who God has created us to be. Sacraments are a continuation of the transformative grace that flowed out from the side of Jesus on the cross (Catechism of the Catholic Church, 1116). Most fundamentally, sacraments are where we touch Jesus today. 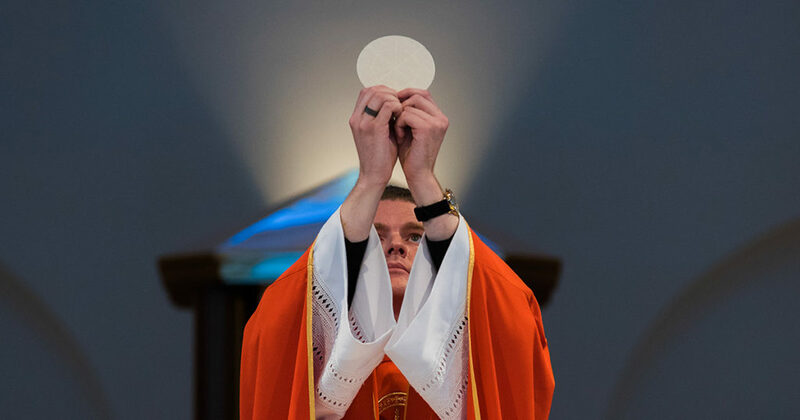 For many, both within or outside the Catholic Church, the sacraments may seem like mere rites of passage or milestones of maturity. Often parents baptize their babies, children celebrate first communions, teenagers make confirmations, and couples even marry without considering how these sacraments are far more than mere obligations or special traditions. The sensory words and signs of these sacraments manifest the very power of God alive and active in our world. This union of physical and spiritual in the sacraments touches us as creatures who are ourselves both physical and spiritual, body and soul. In the sacraments, we find a beautifully fitting way of receiving grace through our bodies for the life of our souls. The Eucharist, for example, is far more than an important symbol or even sacred tradition. The all-powerful God presents himself in utter vulnerability as bread to be consumed, so that in receiving him so intimately, he may satisfy the deepest hunger of our hearts. In this complete self-gift of God the Son, all of our human endeavors find their origin and destiny (CCC 1324). The Eucharist is the “source and summit of the Christian life,” the heart of our faith, and the place we find who we truly are—because it is Jesus himself. Ascension’ study, Power and Grace, aims to help us to better grasp the sacraments and to anchor our lives in their dynamic power. With our eyes open to the sacraments’ real power and purpose, we will see that the waters of baptism and chrism oil of confirmation did more than initiate us into an organization. First communion was more than an important milestone of growing up. By seeking deeper understanding, we hope to grow not only in academic knowledge of doctrine, but grow also in a deeper consent of faith. Ultimately, this study is an invitation to return to the powerful, beating heart of Catholic life and reconnect with your own identity and purpose. Just last night, my evening run led me to that same adoration chapel where I proposed fifteen years ago. Catching my breath as sweat beaded on my brow, I knelt and peered again into the same mystery. As a husband and father who faces my own weakness, folly, and powerlessness over and over, I did not find any quick fixes for my problems. I didn’t find the secret for instant transformation into a better man. I didn’t see any mystical visions. I was, simply and powerfully, brought back to where the life of the believer begins and ends, to the source and summit of grace, to the truest and surest reality—Jesus. Aimee and Colin MacIver are co-authors of Power and Grace: A Guide to the Catholic Sacraments, TOB Teens Middle School, and The Parent and Sponsor Guides for Chosen: Your Journey Toward Confirmation. Both are graduates of the Franciscan University of Steubenville and teach at St. Scholastica Academy. They live in Covington, Louisiana with their two children, Leo and Zelie. Colin is host of the TightRope: Reflections for Busy Catholics podcast.